After last week's slightly disappointing And the Cost of Education, I was pleasantly surprised with And the Hollow Men. This is a return to form, thanks to some wonderful guest performances and the return of Flynn Carsen (Noah Wyle), who handles double-duty as director. 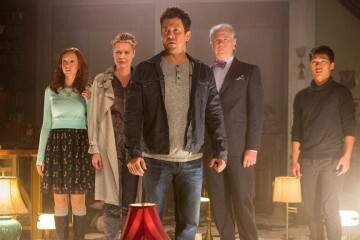 Like all actors-turned-directors, Wyle at times was a bit showy, but by and large And the Hollow Men restored The Librarians to the fun and breezy show it is (even if I found the ending here too a bit downbeat). The Librarians Stone (Christian Kane) and Jones (John Kim), along with the Guardian Eve Baird (Rebecca Romijn) have broken into a home that has various Library artifacts in search of one in particular: the Eye of Zarathustra. This orb will lead one to the Staff of Zarathustra. Jenkins (John Larroquette) and Cassandra (Lindy Booth) are at the Annex, guiding the others while similarly struggling to keep the Library from getting more jumbled (Jenkins, to his irritation, found the Zenobia Wing had shifted from the attic to the secondary basement). To the Librarians' surprise, also at the mansion is none other than Flynn Carsen (Noah Wyle), who had left to search for artifacts on his own. Baird is not too pleased to see her paramour, but before they can settle things both realize that this was a trap to get them both out of the way. With a little help from Pan's flute (which puts people to sleep), an unknown figure steals the orb and kidnaps Flynn. That figure is Ray Glasney (Drew Powell), who has many of the artifacts but also has amnesia. He does know that he feels safe with Flynn, whom he hightails it with in his own Bookmobile (and seriously, what library DOESN'T have a bookmobile). The other Librarians begin a search for Flynn and trace him to a shipyard, where in a container they find things are much more curious. Their pictures line the walls, and Cassandra realizes that the organization is in Dewey Decimal System. Enter Moriarty (David S. Lee) to make things more chaotic. He too is after Flynn and Ray, as well as the Orb. A battle ensues between The Librarians and The Fictional and his Minions, and while Jones, Stone, and Cassandra manage to escape, Baird is locked out. It's here where the still-besotted Moriarty (who still calls Baird "Duchess") offers they work together for a mutual goal. She isn't particularly thrilled by this, but realizes this is her only alternative, so they take a truck to pursue Flynn and Ray with help of Ariel. Flynn finally realizes who Ray is: he is the living embodiment of the Library itself, which was separated from the Library when it was restored. Flynn realizes he needs to Staff to restore Ray/The Library to his right senses, and that time is of the essence. The Library, without its spirit, is dying. Jenkins is forced to use ghost lights (the lights from every theater stage that is left on, drawing on every emotion the audience releases) to keep the fading Library from eventually consuming itself. He urges the others to save themselves, as when the last light goes out it will take their lives, leaving Jenkins last (as he has lived longer than all of them). While Jones is not opposed to the idea of leaving, the three ultimate refuse to leave Jenkins, willing to face death with him. Meanwhile, Flynn and Ray discover the ancient Sumerian temple in Pennsylvania (where else?) and begin to go within it to find the Staff, facing many dangers. Baird and Moriarty are in hot pursuit of them, leaving Flynn shocked that they are in cahoots. When Ray finds the Staff, the power begins giving him too much information and begins killing him. Baird and Flynn begin arguing over who should take the burden, when Moriarty offers his own solution: he will take the staff. As he points out, as a Fictional he will not be harmed by it. Flynn isn't happy about this at all, but to save the Library he agrees to do so. With that, the Library is saved and restored to life, but Moriarty does have the staff. Flynn leaves again, this time less pleased with Baird than in their last meeting. And the Hollow Men is a fine return to form after the still-good but weak And the Cost of Education. A great of my enjoyment came from Lee's performance as Moriarty. Lee makes Moriarty less a master villain than a suave, almost likable figure, fully aware of his powers yet powerfully drawn to Eve, his Duchess. Lee balances appropriate menace with humor. "You're not as charming as you think you are", Eve tells Moriarty. "I'm precisely as charming a I believe I am. It's in the decimal place", is Moriarty's response. He is certainly a villain, but Lee makes him a humorous one in his barely concealed irritation at the Librarians' antics. There's a slight eye roll when Stone attempts to outwit him (leading to Stone appearing clumsy and Moriarty more frustrated that this group is the one that challenges him). Whether Lee as Moriarty does his best to be evil (which he is) or whether he is playing charming, slightly love-struck archnemesis to Baird, Lee is just really, really good in the role. Curiously, this is the first thing I've seen Powell in since he was The Penguin's henchman, and it's a credit to him that he could be so at home in the dark and gritty world of Gotham and in the breezy fun of The Librarians. Powell can play things for laughs (like Ray's great love for milkshakes) and also make Ray very sympathetic, even when he is physically threatening Flynn in his confusion and fear. I'm glad Powell got to show another side to him. It's interesting that as a director, Wyle decided not to make Flynn the center of attention. He should be congratulated for doing a pretty good job behind the camera (and for showing that at age 44, Wyle is still remarkably agile, performing a flip while in handcuffs that is quite impressive). I hope it was an intentional decision by Wyle as director to have the music accompanying Moriarty to sound vaguely like that of the Guy Richie Sherlock Holmes films, because it sounds like a nice in-joke (in more ways than one). Flynn kept things flowing pretty well, though there were a few issues. Normally, I don't pay too much attention to editing errors, but this one stuck out for me. When Baird sees Moriarty coming in her close-up, she turns to face him when she calls out to him. However, in the immediate next shot, which is a medium shot, she is seen turning to face Moriarty again. Physically, this would have been pretty impossible given that when she spoke to him the first time, she should have already been facing him. Also, like a lot of actors-turned-directors, Wyle couldn't resist having the camera circle one of the actors (I'm reminded of when Mark-Paul Gosselaar did the same thing when he directed an episode of his now-mercifully forgotten Franklin & Bash). Still, these are really minor matters. In almost every other way And the Hollow Men is a hit; everything was pretty balanced: the tension of having the Library face death to the generally upbeat ending (though the struggle between Baird and Flynn put a damper on things), the humor of the "Raiders of the Lost Ark" type exploring of the temple and Baird reprimanding Cassandra to not 'go fangirl on the archvillain', and with particular praise for David S. Lee as the...antagonist Moriarty (equal parts menace and mirth), this was my kind of Librarians episode: witty, amusing, and oh so fun.